I recently asked my friends on social media to participate in a yes-or-no survey of fifty different theological beliefs. I’m going to do my best to try to share some of my findings over the course of several posts, and this is the first. 100% of respondents (all forty of them) who answered “are you a Christian” said yes. That’s important, and I’ll come back to it at the end of this post. Of those forty respondents, twenty-nine (72%) of them were male, and eleven (28%) were female. Respondents ranged in age between 18 – 73 years old. The largest group of respondents (seventeen of them) was between 35-50 years old, and the smallest group (only one!) was between 18-25. Three respondents had a high school diploma only, four had a PhD, fifteen had a MA/MS, thirteen had a BS/BA. Of all respondents, thirty-six live in the U.S., and only four live outside the U.S. For the most part, these were mostly college-educated American Christians. From there, things get interesting. Do you believe in Monergism? Do you believe in Synergism? Do you believe in Unconditional Election? Do you believe in Limited Atonement? Do you believe in once-saved-always-saved, and salvation as a one-time event? Do you believe salvation is an ongoing process and you can fall away? In this post I just want to deal with the first two questions about Monergism and Synergism. The word itself is a composite of two Greek words (monos, which means one/alone/only, and ergos which means work). The big idea behind monergism is the insistence that God is the one and only one working to bring about our salvation. This word is also a composite of two Greek words (syn, which means together or with, and ergos which means work). The big idea behind synergism is the insistence that God works with human beings in a relational way in order to bring about their salvation. Synergists stress that though it is God who saves us, without the participation and cooperation of human beings in their own salvation (belief, repentance, wilfully turning to God, etc. ), they cannot be saved. Synergists, on the other hand, point to the many scriptural admonitions to unbelievers to repent and turn from sin. They insist that sinners are responsible to do so in response to God’s offer of salvation, and insist that refusal to cooperate with God will surely result in being lost. For the monergist, God does everything it takes for us to be saved. He is the only one working. For the synergist, God provides the means by which we may be saved, but calls us to respond in faith and obedience. Of course many many (many many) books have been written about this subject, and there is no way to lay out all of the arguments in a blog post, but these are the contours. Interestingly, only 35 of my 40 respondents answered the question about Monergism/Synergism. This may be because they are not familiar words to everyone who participated. Of those who responded, twenty-seven (77% of them) identify theologically as synergists, and eight of them (23% of them) identify theologically as monergists. Putting all my cards on the table (and you already know this if you know me), I am one of the synergists in the group (yes, I took the survey too!). That means that I believe two things at the same time: (1) That salvation is fully, completely, and 100% the gift of God, and there is nothing we can do to earn it. But (2) I also believe that it is a gift that must be accepted in order to be of any value to us. We may based on the testimony of Scripture (as interpreted by synergists like me), either refuse or accept God’s free gift. Synergists insist that accepting a gift is not earning a gift. Nobody believes that, and for synergists, responding to God’s gift of grace is not to be conflated with earning our salvation. Rather, it is the appropriate response to God’s generosity. It is our “work” (ergos) to believe, and it is God’s “work” (ergos) to provide for our salvation. Synergists insist that these two realities exist together (syn) as the way in which salvation becomes a reality in the lives of those who benefit from it. In other words, synergists believe that God’s work is to send his son to freely give himself in the work of accomplishing our full salvation. Our work is to believe in him whom God has sent. What about you? Are you more convinced by the idea of monergism or synergism? 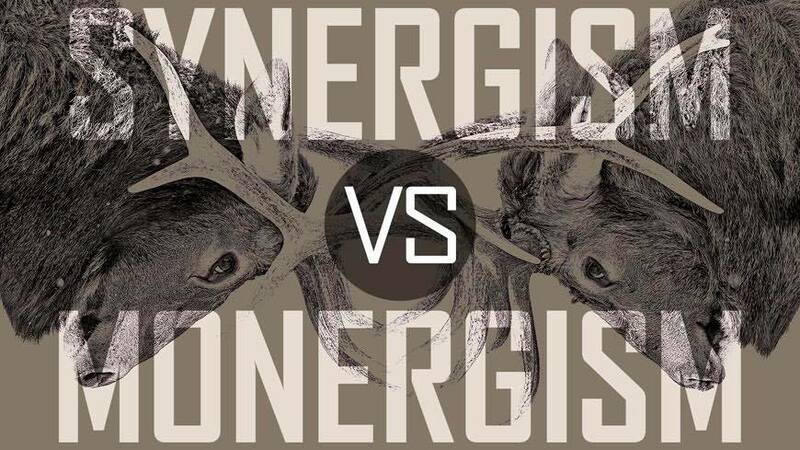 Here’s a great podcast by Dr. Leighton Flowers about the differences between monergism and synergism if you want to think about it more. Walter A. Elwell, Evangelical Dictionary of Theology: Second Edition (Grand Rapids, MI: Baker Academic, 2001), 786.